Many folks set aspirational goals such as visiting every continent, climbing every mountain over a certain height or running your first marathon. A common goal of many Americans is to visit all 50 US States. I am proud to announce the availability of my first application, “Fifty States”. It is a simple application to keep track of how many of the 50 US States you have visited. I designed the application so you can record more than one visit to each state, along with the date and a short note about your visit. It’s simple, but the app does one thing and I believe that it does it well. While I work in the software industry, programming is not part of my daily job. This was my first time programming in Silverlight, or C#. There was definitely a learning curve, but I was able to create my app in the evenings over just two weeks. I started with the code samples in the SDK (Databound & Pivot were most instructive), leveraged online tutorials (31 days of Windows Phone 7) and asked questions on the developer community at http://create.msdn.com. With all that I have learned, it would take a quarter of the time to do it again from scratch. One of my goals was to create an application which could leverage one of the unique features of the Windows Phone 7 platform, the ability of the app developer to offer a single installable package that contains both the trial mode functionality and the paid application. This is much easier for developers, as they do not need to create both a free version of their application and a separate premium paid application. Windows Phone developers are free to decide how they want to limit the trial version. Game developers might choose to only offer the first 5 levels, app developers might include advertising in the trial version or offer premium capabilites to paying customers. I finally settled on my own trial behavior, which allows users to use all of the capabilities of the app for free, but limit them to record their first 10 visits to any combination of states. I settled on the lowest price of $0.99, the app has a limited number of features at this time. The Marketplace is flexible enough that developers can change prices at any time, for example I could raise the price due to additional features, but customers who purchase the application now would get free updates. I also made a nice icon for my application. I wanted to create something which respects the stark iconography and bold colors of the Windows Phone 7 design guidelines, but I also wanted to create something that stands out on it’s own. I settled with a custom white icon on a background of a red leather-bound book, to evoke the exterior of a high-end journal or travel guide. I’m not sure if it works well or is too bold, but I welcome your thoughts. I picked this project as it was something I thought I could do well and there was nothing quite like it available on the Marketplace. 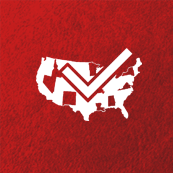 I initially planned to simply create a checklist app with a single checkbox for each state, but that didn’t reflect the reality of travel, that you may visit one state many times before you visit your last state for the first time. I am proud of my app, but also welcome your feedback, any bugs you encounter, or any features ideas I should consider. Please leave a comment on this blog with your thoughts. I hope you like it! If you have a Windows Phone 7 and would like to try my application, please Download Fifty States on the Zune Marketplace for Windows Phone 7. Your app looks great. I like your icon, though I didn’t get the leather texture concept till you mentioned it. Great blog site. I came across your site when I was looking for who posted a photo for windows 7’s public photos. I googled your name and spent a good hour perusing your blog. You have lived an interesting life with miriad travels. I am a teacher of 16 years in Illinois. My wife and I have been interested in the Seattle area for a few years – coincidence that I found your blog?!? If you find the time, would you be interested in answering some questions about the Seattle area – I am looking into teaching opportunities out there, but would be interested in some “on the ground” perspectives of daily living. Either way, I really enjoyed your posts. Thanks for sharing! Love this app (and icon). Would really be nice if; dates added to list would automatically arrange themselves in chronicle order and (maybe) if a ‘thru’ date could be included. And dream? Ability to attach photos to entries. Alot to ask for 🙂 I have enjoyed using this app to track my trips. Thank you! Thank you for your support and constructive feature ideas / feedback. I agree that entries should be sorted by date. This should be easy and I will look into fixing this for a subsequent update. 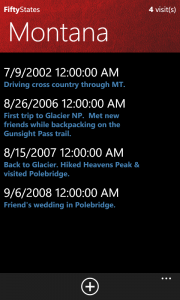 Adding support for a date range is interesting and I will think about it. I have also considered allowing users to record a visit without entering a date at all. As for more advanced functionality such as the ability to attach photos,.. we’ll see. If you enjoyed this application, please show your support by rating the application on the Windows Phone App Marketplace… Your reviews and comments help others find and enjoy this app. 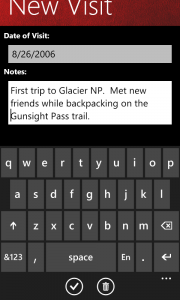 I’ve also just completed a related project, National Park Checklist for Windows Phone 7. Please give it a try.